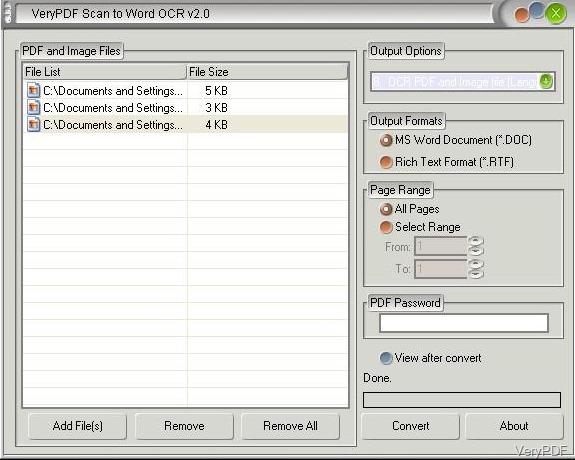 Scan to Word OCR Converter is a very useful software which is designed to convert scanned images and PDF files into editable Word and RTF documents.Mang users may be in trouble with converting scanned images into Word and RTF documents in batches. However, with this software , the users can save themselves from the headache and finish it quickly and profesionally. This artical will tell the readers how to convert the Scanned images and PDF files into editable Word documents in batches. 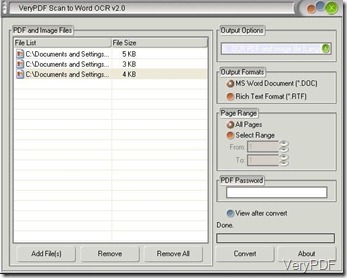 More functions about Scan to Word OCR please click here! In the left side of the interface is a list of scanned images or PDF files which you need to convert. Click the button”Add Files” on the left side of the interface, and select the scanned images or PDF files, or you can drag them into the interface. The button “Remove ” next to “Add Files”is used to remove the selected PDF files and if all the PDF files are needed to clear, just select all the PDF files in the list and click the button “Remove All”. On the right side there are four group boxes listed . Users can choose the related option to meet their own needs. the first combo box is about the output options in which the firs seven are used for the output layouts. From 8 to 13,six languages are offered for the users to chooses from: English, French, German,Italian Spanish and Portuguese. with the advanced OCR technology, this applications can recognize six languges and convert different languages scanned images and PDF files into editable Word and RTF documents. The next group box is about the output formats. Two formats are offered: MS Word Documents (*.DOC) and Rich Text Format(*.RTF). Choose the right format according to your own needs. If you want to convert all the listed scanned images into editable Word and RTF documents, select the option “All Pages ”in the group box”Page Range”, if you want to convert specified pages into editable Word documents, select the button “Select Pages”and input the page number into “From and To”. Input the password if the PDF files are encrypted. Click the button”Convert”and a few second later they can be converted into the editable Word documents. If you are in trouble with such problems and do not know how to deal with it, please try this software , you can free download the trial version and experience the advangtages of it, however, the software has some limitations which will be absent from offical version. How to convert prn to tiff via command line? I want to save HTML webpage to PNG, what should I do?